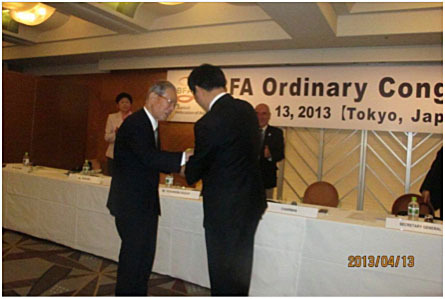 Tokyo: Tom Peng of Chinese Taipei was elected unopposed at the BFA Congress held in Tokyo on Saturday, April 13 2013, previous day of the IBAF Congress. In his inaugural address, Peng assured “Just like the way I have worked for my construction company, I will treat this project with the highest professionalism and commitment and build the BFA on strong, useful and steady foundation.” “No racism, no cultural difference but only one language: the baseball language!” said Peng. Yoshinobu Suzuki (Japan), Ms. Shen Wei (China) and Kim Jung-Up (Korea) were elected unopposed unopposed as Vice Presidents and Lin Hua-Wei (Chinese Taipei) was named as Secretary General. In the ballot, 3 members at large were confirmed: Alan Mak (Hong Kong), Vutichai Udomkarnjananan (Thailand) and Tom Navasero (Philippines). In addition to these executive positions, the new President Peng nominated Kazuhiro Tawa (Japan) as Senior Advisor to BFA and plans to ask Khawar Shah (Pakistan) to play an executive role to develop baseball in West Asia. Outgoing BFA President Seung-Kyoo Kang presented Presidential Award to 5 people for their contribution to the development of baseball in Asia: Yukichi Maeda (photo -Japan), Allan Mak Nin Fung (Hong Kong), Shaukat Javed (Pakistan), Kunifumi Itakura (Japan, nominated by Philippines) and Heo Koo-Young (Korea). VP Suzuki awarded a plaque to President Kang in appreciation of his contribution during his term in the office. Out of 24 countries/regions in BFA, 18 National Federations were represented at the BFA Congress, namely: Brunei, China, Chinese Taipei, Hong Kong, India, Indonesia, Iraq, Japan, Korea, Malaysia, Mongolia, Nepal, Pakistan, Philippines, Singapore, Sri Lanka, Thailand and Uzbekistan.